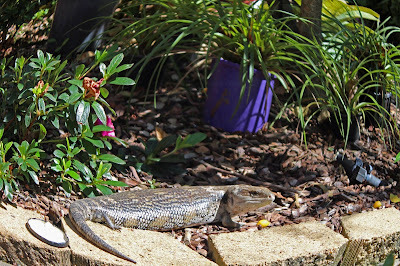 The blue-tongue lizard is our friend in our garden as they do their bit in eating lots of pests. Their diet consists of plant matter and small animals - beetles, caterpillars, crickets, snails and even other small lizards and they are particularly partial to slugs and snails. Anything they can get hold of will do them just perfectly - this can be a bit difficult for them as they are so slow moving, so their prey is often something that moves fairly slowly too! Dog or cat food is another thing that they enjoy and strawberries for dessert! Blue-tongued lizards have really unusual body proportions with a big head and a long body with very short legs and small feet. Their evenly tapering tail is fat and shorter than the body. Male lizards have a proportionally larger head than females, but the females are bigger overall. 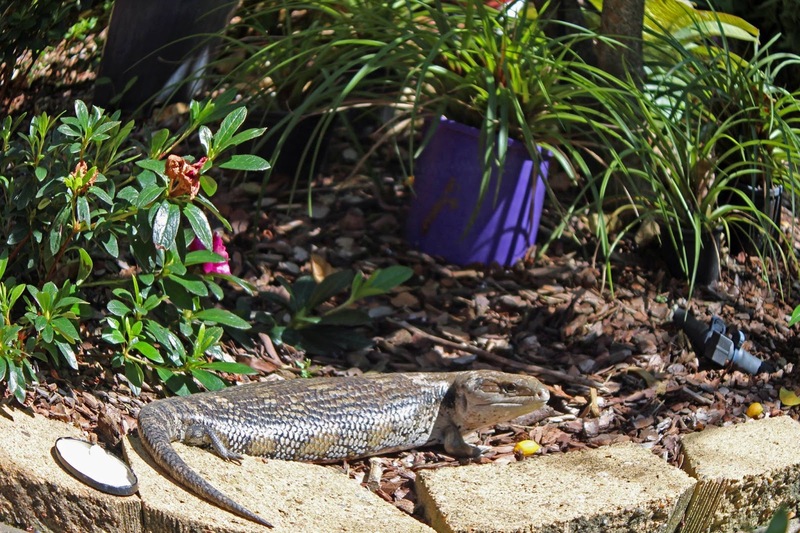 The most noticeable feature of these lizards is the blue tongue inside the bright pink mouth. Like all reptiles they do not produce any body heat. Their body temperature depends on the surrounding temperature and they can be found sun bathing in the mornings or during cooler days. They need a body temperature of 30 - 35C degrees to be active. 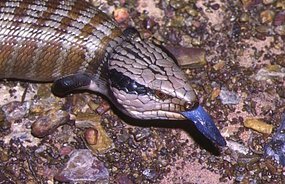 Blue-tongue lizards have really strong jaw muscles to crush big beetles and snail shells. They may also bite in defence when they feel threatened. The main defence stategy for this lizard is bluff - it faces the threat and opens its mouth and the blue tongue inside the pink mouth is an unexpected and vivid sight, designed to frighten off the attacker. The lizard also hisses quite loudly and flattens its body to make it look wider and bigger. If you pick the lizard up when it is like this it will bite you and it will hurt. Blue-tongues have a habit of latching onto your finger and not letting go in a hurry which leaves a nasty bruise. Blue-tongues occur here on the Coffs Coast and like tall grasses, leaf litter, rocks and logs, low shrubs etc under which they will shelter at night. During the day they sun themselves until they are warm enough and then they forage for food during the warmer parts of the day. These critters live alone for most of the year. Its only during the mating season between September and November that the male will pursue females (and fight other males). Mating is a rough affair and many females carry scars from the male's teeth. Female blue-tongues stay within a defined home base. The males wander over an area the size of about 15 house blocks and have several female 'friends'. Blue-tongues are born alive, about three to five months after mating. From the moment they are born they have to start looking for food themselves - they commence this by eating their placenta and they will be off on their own within a few days - its tough love for a blue-tongue! The blue-tongue is a long lived reptile if it gets the chance. It does have a lot of hazards to avoid if they do live for many years including lawn mowers, cars, cats and dogs. Cats are the worst however, dogs seem to be more perplexed by the blue tongue's threatening behaviour and generally keep their distance. 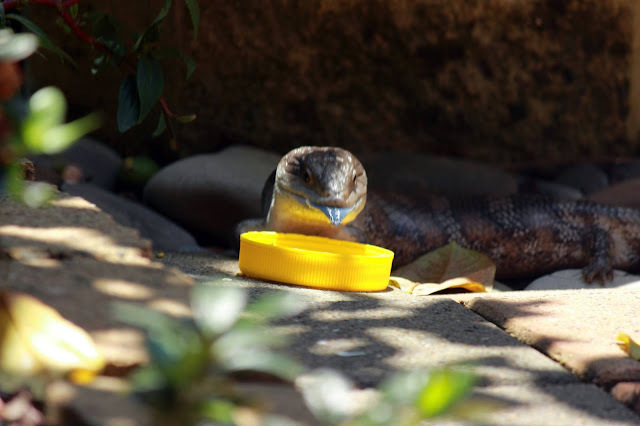 Baby blue-tongues may end up as supper for currawongs, kookaburras or snakes. If the need arises blue-tongues can drop their tails to escape a predator. The stump will heal quickly and a new tail will start to grow but this will take about a year for a new tail to fully regenerate. The lizard must have a stable food source during this time as all the food and water reserves are stored in its tail.